It's not a playground, it's an adventure play environment. We've been going out to Richmond fairly often in the past year to visit a friend who lives there. We often go for a bike ride along the West Dyke Trail & were curious about the playground we saw from the trail as it was being built. It had been on the list, in the back of my mind, for a while when I read an article about it three weeks ago. So did everyone else, apparently. I heard reports from friends who went shortly after the article came out of 40-kid lineups for the more popular playground equipment. Last weekend we were out in Richmond again, babysitting our friend's daughter so mom could go donate blood. 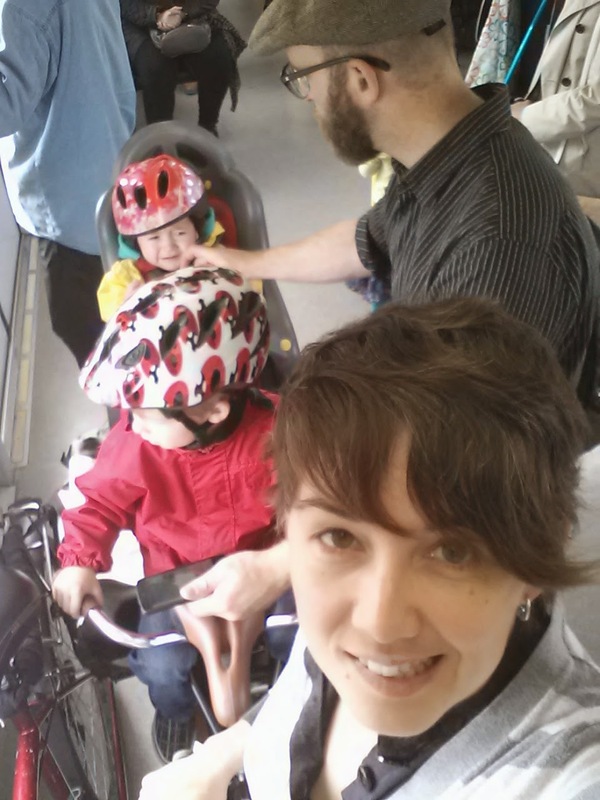 We biked the three kids over to Terra Nova to see the new playground, hopeful that the crazy crowds would have abated. Well, they sort of had. There were still 20-kid lineups for the tall spiral slide & the zip line. Everywhere you looked there were kids on the play equipment & with a lot of trees throughout the park, it wasn't easy to keep an eye on the four-year-old & five-year-old while the one-year-old slept in her bike seat. The slides were taller than anything else I've seen in playgrounds in Vancouver. Much of the equipment was made of logs, rather than the metal & plastic stuff that seems to be the standard nowadays. There is the 'log jam' that looks like a pile of badly stacked logs, great for clambering on & under. Nearby is a sort of obstacle course thing (billed as an 'aerial walkway', it's about 1-2 feet off the ground) with ropes to walk along & steps to jump from. The whole place has a slightly more natural feel to it, probably because they've left so much of the trees & shrubs around the play areas. The rest was pretty similar to the stuff in the parks around Vancouver: a merry-go round rope pyramid thingie (though the Terra Nova one is inverted), large disc swings, big half-buried rocks to jump along, rope nets to climb up, zip lines, slides, a small water play area. 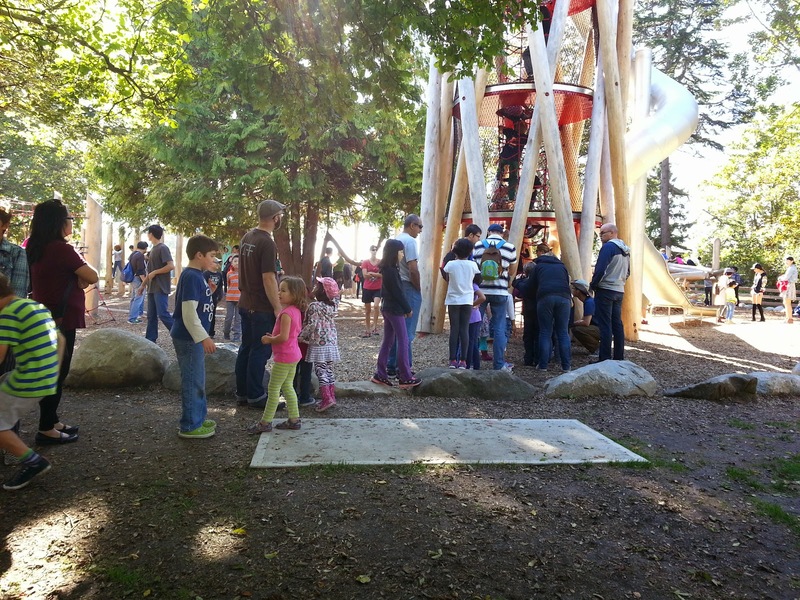 It is a lovely park, but I have to say, with all of the trumpeting about ONE MILLION DOLLARS, etc, I expected something completely different & better than any other playgrounds we've seen in Vancouver. 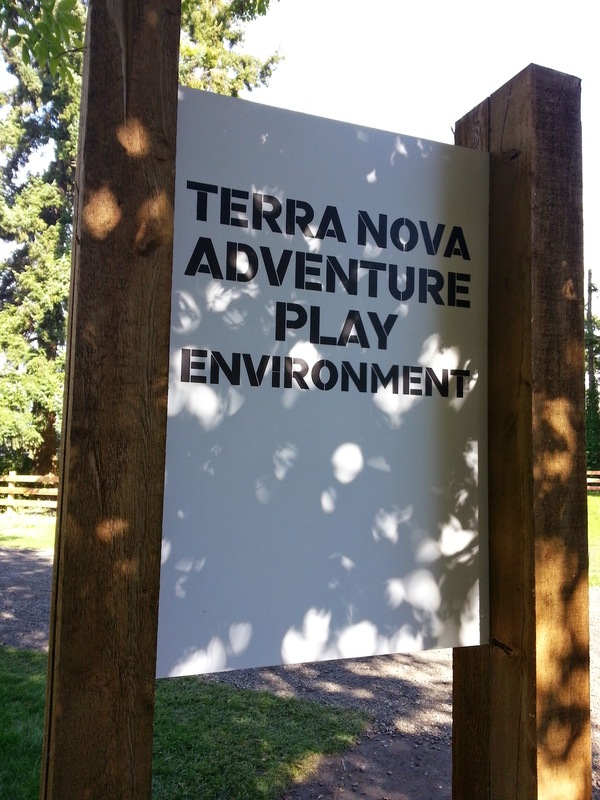 Terra Nova is partly conceptual art--perhaps that's part of what's behind calling it an "Adventure Play Environment" rather than a park or a playground. Hapa Collaborative, a local landscape architecture firm, created the park with references to the area's history. You notice it in the fishing net-like climb up to the spiral slide, & the 'log jam' climbing structure. There is also a fence maze of some sort which I didn't see. The kids spent a third of their time waiting in lines, maybe another third eating lunch--we didn't actually explore the entire park. Hopefully we can go back again during the week when I suspect it'll be much less busy. Half of the playground is well shaded, which will be nice on hot days in the summer, but all those trees make for poor sightlines--an issue if you have more kids than adults to watch them. The shrubs separating the two halves of the playground & the parking lot make it feel a bit secluded. The part of the playground with a large hill, near the ziplines, is totally open. There are several wooden picnic tables there, which are unfortunately not shaded at all. Near the tables is a row of portable toilets, but I warn you: they are in dire shape. If you don't have to use them, I would avoid it. Apparently, proper washrooms are in the plans for the park eventually. Though the park is right on the West Dyke Trail, the majority of people drive to it. There were three bike racks that I saw. The large parking lot accommodates about 80-100 cars. Transit doesn't go that close to the park--the #401 bus along No. 1 Road is maybe a kilometre away. 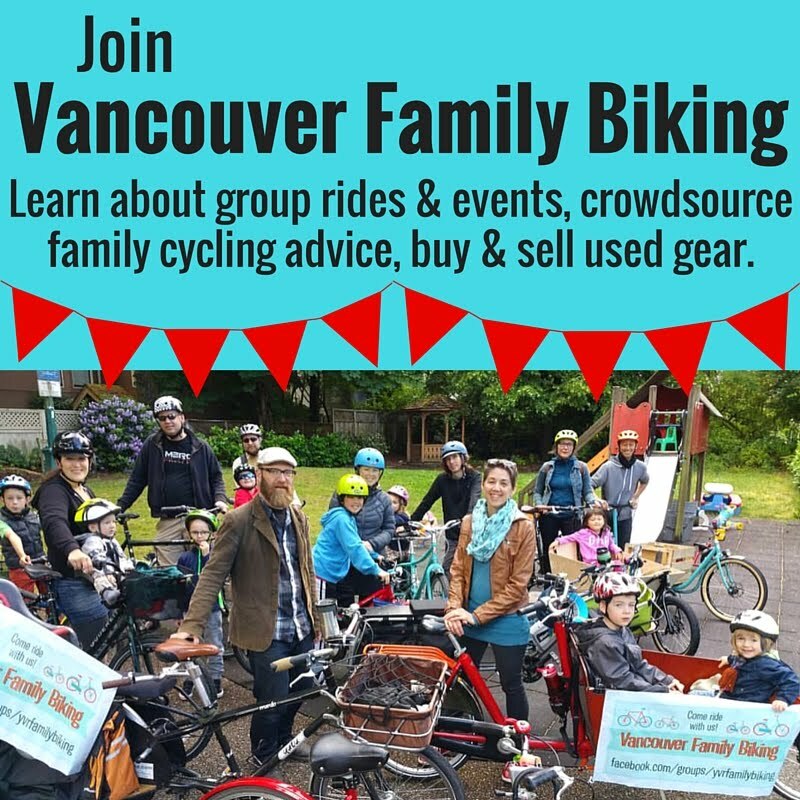 We did our usual multi-modal trip to get there: bike to the Canada Line, then get out at Lansdowne Station, then bike to the dykes, about 5km. It's only five minutes until you're off road, but the streets are rather lacking in bike infrastructure. Though it's not busy, you do need to be cautious at the blind corners & a couple of oddly designed intersections. I liked the natural feel to the park & I think the structures are designed to encourage the kind of play & risk taking that's good for kids. Terra Nova is definitely meant for kids four or five & up. Even kids that age will probably need help getting up to the tallest slide, or using the zip line. I think kids of six to ten would love it. 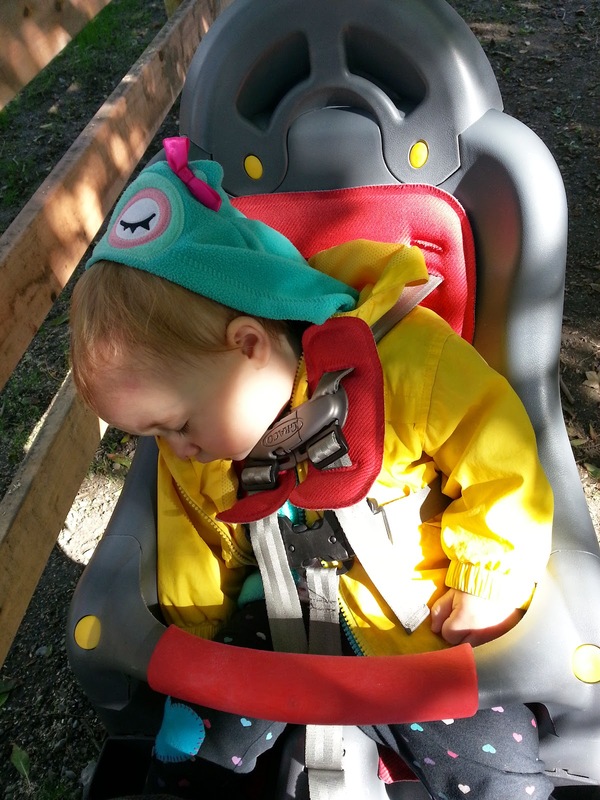 There wasn't really anything that the baby could use at all, unlike most parks in our neighbourhood, which usually have something for toddlers. We'll go back, but I'm not sure we'll make a special trip just for the park. Have you been to Terra Nova yet? What were your impressions?